OCAP | CUPE 3903, we got your back: Strike to Win! CUPE 3903, we got your back: Strike to Win! Below is an open letter of solidarity sent to CUPE 3903 – the union representing teaching and graduate assistants, contract faculty, and part-time librarians – at York University, who have been on strike since March 5. 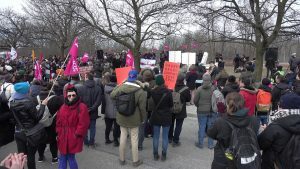 The Ontario Coalition Against Poverty (OCAP) expresses it full support for and solidarity with the present struggle of the members of CUPE 3903 against your employer, York University. We’d like to set out why we take such a position. OCAP is, of course, an anti poverty organization. We take up struggles and campaigns on the issues facing poor and homeless people. They are the most extreme victims of the agenda of neoliberal austerity that you are confronting. Income support systems have been gutted, so as to create a climate of desperation and force people into the lowest paying jobs. Housing has become unaffordable and hundreds of thousand live on the edge of homelessness, while thousands face overcrowded shelters or the streets. Right here in Toronto, the neoliberal city, York University is making its own major contribution to this agenda by working to ensure that post secondary education is provided through the super exploitation of workers. The university as a precarious low wage employer is a work in progress and, with its attack on the members of CUPE 3903, York U is trying to advance this agenda with a vengeance. Your Local has shown its support for the fights that OCAP takes up many times and in many ways and we are proud to return that solidarity. However, we also offer our support because your fight is too important to disregard. Your victory in this strike will be a victory for all of us. Correspondingly, it will be a defeat for the agenda of austerity and greed that we are all confronting. We express our full and unqualified support for CUPE 3903 and its present vital struggle. Strike to win!